Juniper SCB-MX-S - for Juniper MX960 - Enhanced MX Switch Control Board - SCB-MX960-S"
Once the number of servers to be managed or other computer systems increases in an enterprise, it is time for a comfortable solution to search, which allows easy switching between devices. Once the number of servers to be managed or other computer systems increases in an enterprise, it is time for a comfortable solution to search, which allows easy switching between devices. 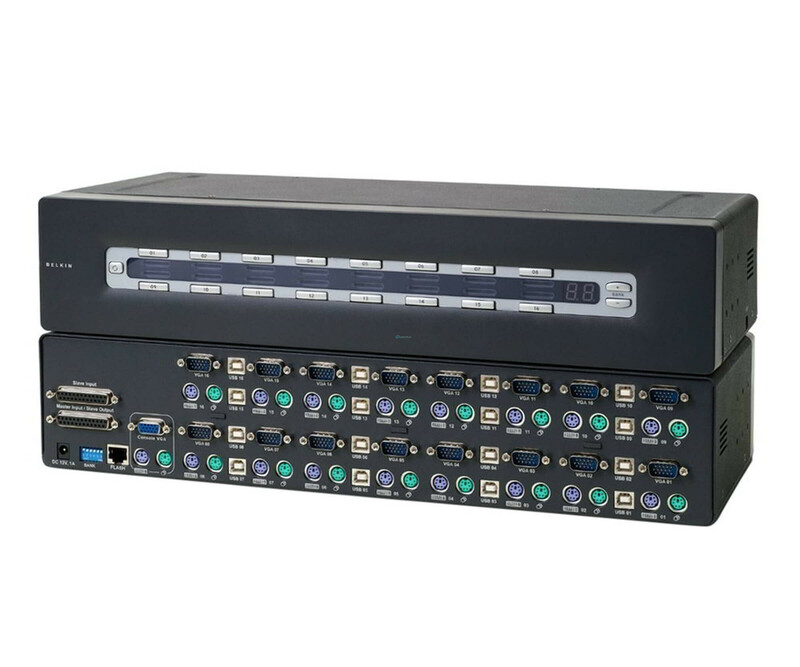 Belkin offers with the OmniView Pro2 a KVM Switch at the 16 systems can be simultaneously connected to switch with a single push of a button between them. From us you get the new OmniView Pro2 in the unopened original packaging, with the complete accessories manufacturer Belkin. These include on the one hand, of course, a user manual, as well as the power adapter and a USB flash cable. Used in server racks, occupied the KVM switch 2 height units of the rack, making it ideal for a local administrator suited the needs easy access to various systems. At the back are each 16 PS / 2 keyboard and mouse ports, VGA and 16 ports and two DB-25 interfaces for network-stacking device. For the local console is of course also depending on a keyboard, mouse and monitor connection available. About a RJ45 port allows the Belkin OmniView Pro2 KVM Switch manage from a distance. From the connected screen you have a maximum resolution of 2048 x 1536 pixels at 85 Hz. At the front of the OmniView Pro2 Status LEDs indicate the activity of the individual channels. A convenient OSD function you also displays the respectively selected server, which can be individually named. Various hot keys also provide a quick and easy operating features.